When I was in Cornwall recently I bought one hank of a lovely aran weight pure wool for a friend who wanted to (re)learn how to knit (he chose it). He mastered the knit stitch quickly enough, but after a while knitting a scarf in garter stitch, concluded that the wool was a little too scratchy to be worn next to skin around his neck. I hence inherited 380g of undyed aran wool I had no project for. Quickly, an idea presented itself: I could not resist trying to knit a Hemlock Ring blanket, because it's a such a gorgeous pattern. 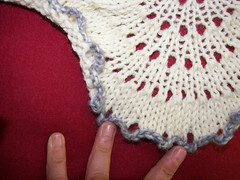 Let me share a secret: I'd rather knit something from a written out pattern than from a chart. Charts are great to help me understand what's going on, yes, but when it comes to following the pattern I prefer to read out written instructions. Which in this instance was great, since the Hemlock Ring is written out and not charted. Still, I am also tempted to chart it, just to put the chart out there - it seems a little sad that only the latter, expanded part of the pattern that Jared charted exists out there (most likely, this idle thought of mine will never lead anywhere. but it's a nice thought for something useful to do one day!). The knitting went well, though it was tiring in places, because I was of course dealing with an increasing amount of stitches on a limited circular needle. 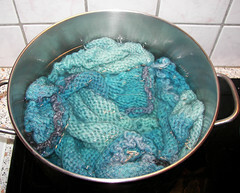 Then I hit the end of my 380g of Dales pure British wool, and I wasn't done. I could have stopped there, of course - backtracked and knit the border and call it a small lap blanket, but I wanted it bigger. Fortunately, I had in the stash two skeins of undyed DK weight French wool (sheep from the Pyrenées, wool washed, carded and spun in Ardèche, bought on a market in the Massif Central). ...repeated as many times as possible (O = yo). I tried to knit it as written; I tried the same with only one strand of my DK wool instead of too when that looked too bulky and blah; I tried making it less "round" (to better match the picture) by knitting only 3 stitches in one instead of 5. I knew of course that the picture I was trying to match was of a blocked blanket edging, but even with the magical blocking to come, I could not believe that the bulky round scallops I was knitting would ever become anything approaching that image I loved so much. 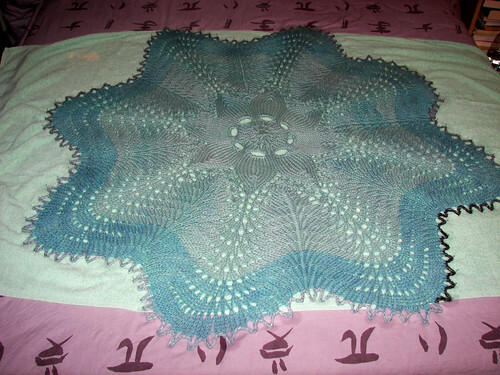 In the end I opted for the crocheted border, which I chose to do with the grey-white variegated Monoprix yarn Rayure Double (Ravelry link), since my plan was to dye the blanket blue once the knitting was over. Crocheting it went by much, much faster, too, and though I see now that blocking probably would have made the difference, I'm not sorry. It's not very big - under 4 feet across, smaller than Jared Flood's I think (which kinda bugs me because I used a lot more yardage than him, seems like!) and there are rather big mistakes in the beginning, right past the flower, but even though they're big I don't think people will see them. Much. When I'm not pointing them out, anyway.